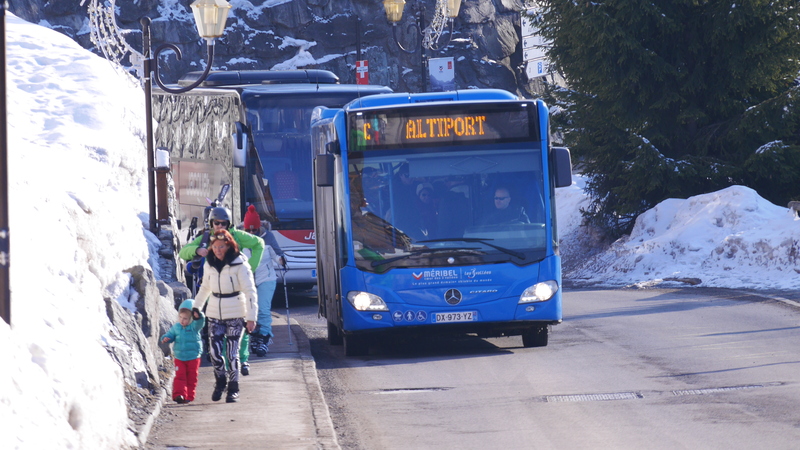 All aboard…The Alpine Action guide to getting around Méribel by bus. Transport and transfers are part and parcel of planning your ski trip and getting you to the resort, but what about when you’re all settled in at the chalet, or exhausted at the end of a hard day on the slopes, and are wondering how to get around by bus in Méribel? Enter those bright blue ‘Navettes,’ pulling up at a bus stop near you every 15-20 minutes. The villages and resorts that make up the Meribel valley are thankfully very well connected by the fantastic Meribus service. The completely free to use, the hop-on / hop-off service runs seven days a week from early morning until Midnight and makes getting around the resort super easy. You can take your skis and poles on board with you but make sure you keep a hold of them. 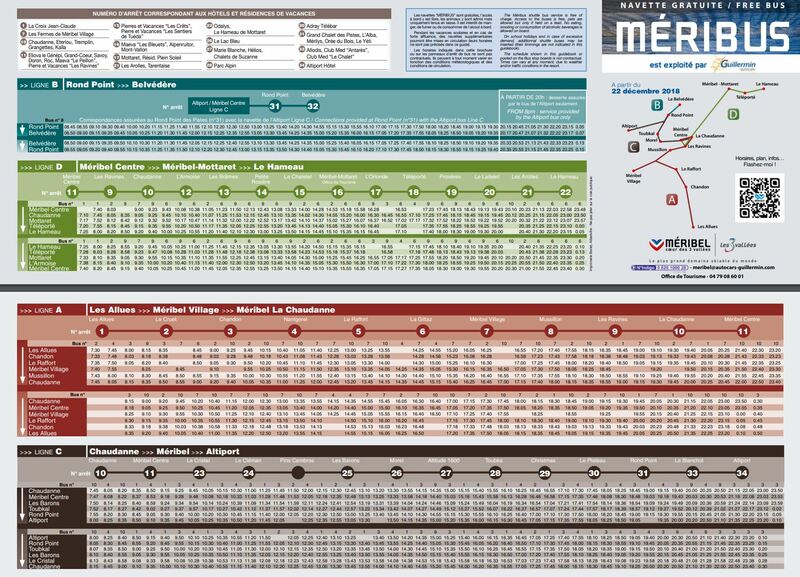 Timetables are available at each stop or you can pick up a copy in resort. Handily all Meribuses come with free onboard WiFi so you can always check the website for routes too (in between uploading your latest ski selfies to social media) . There are four lines: Line A links Les Allues and Méribel Village with Meribel centre and La Chaudanne main ski lift area, Line B links Le Belvedere with Rond Point, while Line C runs from La Chaudanne right through Meribel up to the Altiport, stopping at Meribel Centre, Les Barons, Toubkai and Rond Point along the way. Line D serves as a link between Meribel, Mottaret Centre, the Teleporte and Le Hameau. Most of our catered chalets in Meribel are located along on one of the bus routes. If they aren’t then we provide a minibus service at key points in the day. For chalets Telekie, Azalee, Alysson, Virage & Chardon you can catch line B and C.
Chalet Ecureil is located on bus route A. If you are staying in Meribel Village for your holiday in Chalet Rosalie busses on line A will take you to Meribel. Don’t panic if you accidentally get on the wrong line though, as all buses call at La Chaudanne and Méribel centre near the Tourist Office, which makes connecting from one line to another a doddle. While there isn’t currently a free service between La Tania and Méribel, if you’re staying in La Tania, the free ski bus service runs between there and all the Courchevel Valley villages from the main road behind the Montana Hotel opposite La Taiga restaurant. The first bus leaves La Tania at 08.30 to arrive in Courchevel 1850 for 09.00 and then at 10 past the hour all the way through until 01.10, meaning you can well and truly make the most of the nightlife in nearby Courchevel.